A while back, I told you about the climate change challenges facing the tiny island county of Tuvalu. The people of the South Pacific are among the most vulnerable in the world to the harmful effects of climate change. In fact, of the five more threatened nations, three are in Oceania! Sometimes its hard to understand how climate change works. The weather is getting warmer… that’s a good thing, isn’t it? In any case, it doesn’t seem to be changing that fast. However, for people who rely on the ocean for their food and livelihood, climate change is as real as the salt in the sea. In just one generation, Oceanic fishermen have seen species of fish enter their waters that were never seen before — and others disappear altogether. The worst part is that the people who are hurt the most have the least ability to stop it. While people in developed, industrialized nations chomp down on take-out burgers, they are often unaware that those cows were raised on rainforest land cleared to make room for pastures. They also don’t realize that the garbage they chuck into the bin ends up being trucked out to giant landfills just out of sight, and even dumped into the ocean. Have you heard of the Great Pacific Garbage Patch? A giant floating island of plastic garbage in the North Pacific Ocean that is twice the size of Hawaii. It’s enough to give you nightmares! The combination of increasing carbon dioxide emissions and raising ocean temperatures has the result of making ocean water more acidic than usual. Shellfish like oysters, clams and mussels that act as filters on the oceanfloor are the first to feel the crunch — and the fisherman who rely on them are next! As shellfish populations plummet, so do the diets of Pacific Islanders who rely upon them. As traditional sources of food are taken away, these people have to rely increasingly on packaged food brought in on ships sealed in — you guessed it! — more plastic. It’s a scary story, isn’t it? But it’s not over yet, and we can start to make a difference today. – Kick the convenience habit! Laziness is the nemesis of sustainability and environmental stewardship — only you can change your everyday decisions. – Don’t drive, walk. Or better yet: Cycle! Riding a bike is not only good for the environment, it’s good for your body too. – Use a reusable water bottle! According to the World Wide Fund for Nature (WWF), roughly 1.5 million tons of plastic bottles are made every year. – Get involved in local politics. Demand that your town establish mandatory recycling and composting! – Get involved in national politics. Oppose oil developments that threaten to ruin our wonderful natural spaces! 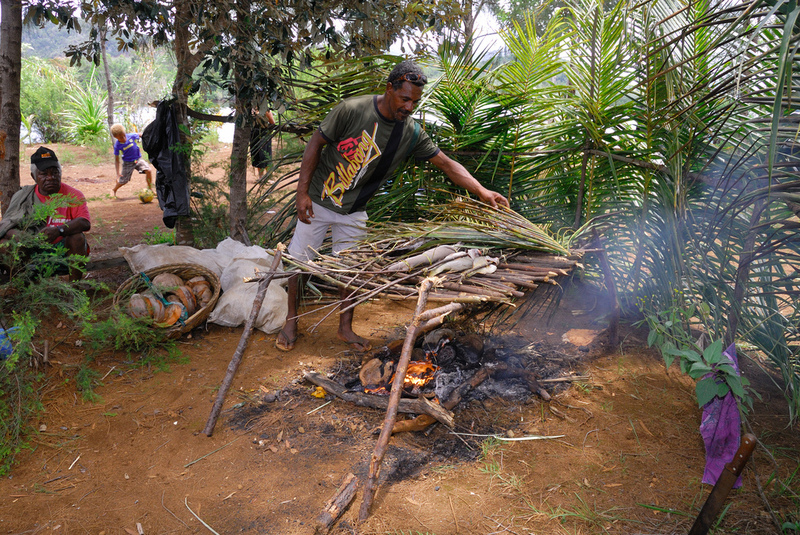 Big mahalo to Christophe for the use of his photo of the fish cook in New Caledonia!